Megadeth is an American heavy metal band from Los Angeles, California, formed in 1983. In September 1990, Megadeth joined Slayer, Testament and Suicidal Tendencies for the European "Clash of the Titans" tour, and in October, they were added as the opening band on Judas Priest's Painkiller tour, culminating with a performance to 140,000 people in January 1991 at Rock in Rio 2 festival in Brazil. Following the success of the European tour, a "Clash of the Titans" US tour began in May 1991, featuring Megadeth, Slayer, Anthrax and opener Alice in Chains. In July, Megadeth's "Go to Hell" (·)) was featured on the Bill & Ted's Bogus Journey soundtrack, and shortly after "Breakpoint" was featured on the Super Mario Bros soundtrack. In 1991, Megadeth also released their first home video, Rusted Pieces, which contained six of the band's music videos, along with a video interview with the band. In April 1988, at a concert in Antrim, Northern Ireland, Mustaine "unknowingly" dedicated the final song to the IRA. Before the final song, "Anarchy in the UK", Mustaine said, "This one's for The Cause!". 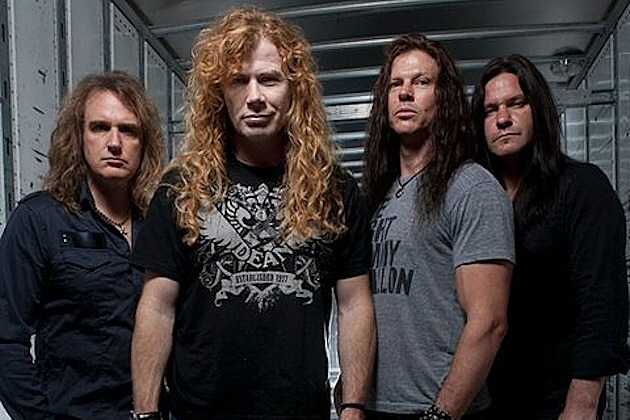 A fight amongst the audience ensued, as Protestants took offense and, according to Mustaine, the band had to travel in a "bulletproof bus" for the remainder of the tour of Northern Ireland and the Republic of Ireland. Mustaine later alleged that he had been misled as to the meaning of the expression "the cause" by T-Shirt bootleggers outside the venue where they were performing. This incident served as inspiration for one of Megadeth's most well-known songs, "Holy Wars... The Punishment Due". With over 25 million albums sold worldwide, ten top 40 albums (including 5 top 10 albums), 18 top 40 Mainstream Rock singles, and seven Grammy nominations, Megadeth remains one of the most successful heavy metal bands of all time. Of the "Big Four" thrash metal bands (Megadeth, Metallica, Anthrax, and Slayer), Megadeth is second only to Metallica in sales and commercial success. Peace Sells... but Who's Buying? is considered a landmark in the history of thrash metal, with Allmusic calling the album "One of the most influential metal albums of its decade, and certainly one of the few truly definitive thrash albums," as well as "one of the best beginning-to-end metal albums ever". In May 2006 VH1 ranked "Peace Sells" #11 on the 40 Greatest Metal Songs of all time countdown. In addition to this, Rust In Peace was named the 3rd greatest thrash metal album of all time by Metal Hammer magazine. "Peace Sells...But Who's buying?" was placed 11th. In 2004, Guitar World magazine ranked Dave Mustaine and Marty Friedman together at #19 on the 100 Greatest Heavy Metal Guitarists of All Time. You need to be a member of MEGADETH to add comments! June is going to be a massive month for metal! Not only will Black Sabbath be unleashing their new album, ’13,’ but Megadeth are also set to reveal their 14th studio effort, ‘Super Collider.’ And just like Sabbath recently laid down the final tracks for their next album, Megadeth just announced to the world that recording for ‘Super Collider’ is completed! Megadeth went straight to their Facebook page shortly after the final touches for ‘Super Collider’ were put to tape in Vic’s Garage, with the band revealing that frontman Dave Mustaine sang the last note for the record on March 13. ‘Super Collider’ will now be mixed, mastered and prepped for a June release. Keep your ears open for new Megadeth material and get ready for the release of ‘Super Collider’ this June! Bio, pics, music and videos have been added. Page is finished for now. Wow, didn't realize. But there is a thrash one, so maybe that's why. You need to get yourself some Megadeth. It'll grow some hair on that chest of yours. Heard Hangar 18 for the first time today. What a killer song. I'll be picking the album up soon. I looked for the Megadeth group to post this comment and realized we didn't yet have one. So here it is.